For the old BlackBerry, a handset's camera was an ancillary feature. But the new hip BlackBerry is supposed to be tuned into how regular people—not just suits—use their phones. The BlackBerry Z10's camera has a chance to prove it's better than the rest. And if our initial low-light camera test is any indication, the camera is a complete failure. When you're in a dark bar or out on the town at night making memories with your co-workers/friends/family you want your smartphone camera to take a nice photo without having to use flash. This is what low-light performance is all about. As we saw the last time we put a series of flagship phones together, handset shooters have come a long way. To see if the BlackBerry Z10 could keep up with the pack, we tested its low-light performance against the Apple iPhone 5, Nokia Lumia 920, and Samsung Galaxy S III. We put it to a pretty tough test, burying the above novelty statue in the deepest darkest corner of the office. We didn't use any flash, but if a camera came with built-in night or low-light setting we tried it out to see if it worked better than the automatic setting. 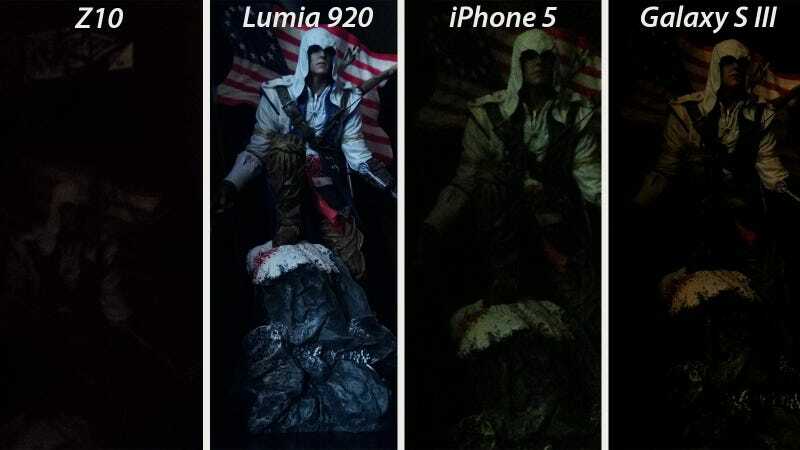 The Z10 didn't even hold the dimmest, most-pathetic light to the other cameras in our test. Look at that photo above on the left. It is an abject and miserable failure. Because this is a particularly difficult shooting setting, all of the photos have problems with noise, distortion, and detail, but we've haven't seen something so crummy as the Z10 in a long time. The Z10 even has a "night" setting that was completely useless. This is some four-years-ago crap. We've still got some more testing to do with the cameras before we crown a winner—and before we write the Z10 off completely—but this initial test doesn't bode well.